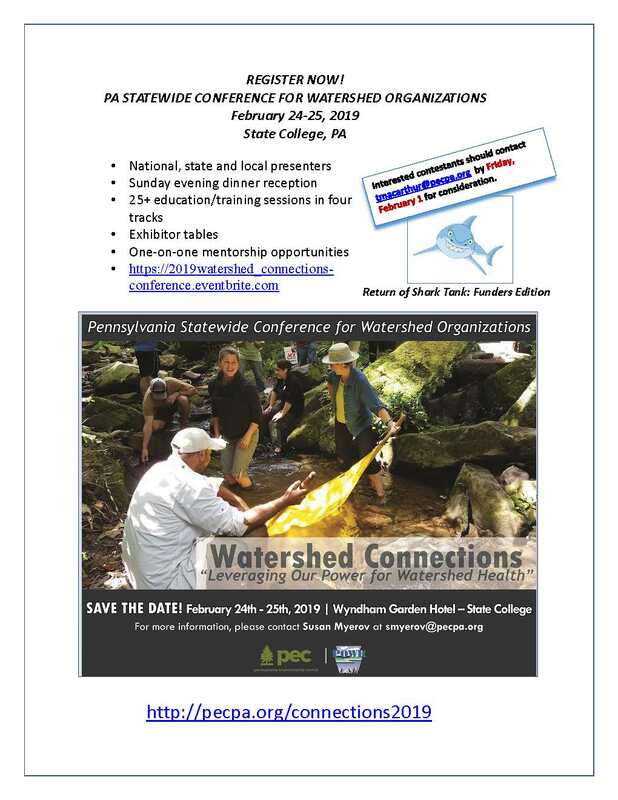 Description: The Pennsylvania Environmental Council (PEC) and the Pennsylvania Organization for Watersheds and Rivers (POWR) invite you to network with colleagues, learn how to strengthen your local organizations, and discover new and emerging resources at the 2019 PA Statewide Conference for Watershed Organizations. The conference will begin at 1:15 p.m. on Sunday, February 24th with our “Telling Stories Through Pictures” opening session, followed by breakout concurrent sessions in four tracks: Organizational Capacity; Aquatic Monitoring and Data Use; Watershed Resources and Programs; and Watershed Policy and Planning. Sunday evening kicks off with a dinner reception and the return of our “Shark Tank – Funders Edition” program. Monday, February 25 will begin with breakfast roundtables, followed by an opening plenary session featuring our Keynote Speaker, Dr. Tora Johnson. Concurrent sessions will then continue until we wrap up by 3:45 p.m. on Monday with a brief gathering and special activity. The preliminary conference schedule, sponsorship opportunities, and lodging instructions are available here. Registration: Click here to register. Registration is available for full conference as well as single-day attendance. Please note that regular registration deadline is February 14th! Note: Limited scholarships available to attendees to cover registration costs. Please contact Susan Myerov (smyerov@pecpa.org) for more information or questions.